Bust is quite narrow in comparison to the measurements, not suited for more than E cup.Dress hits above the knee with a 1.70m lenght. New collection! The 50s Regina White Hibiscus pencil dress from Collectif. Aloha! 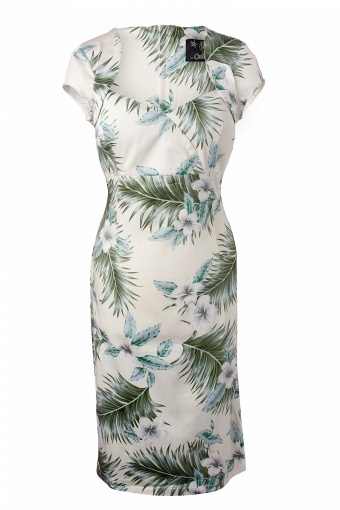 Get the best start of spring / summer with this lovely and vintage style floral print in cream with dark green. It features a sweetheart neckline and playful cap sleeves that gives a bolero impression. This dress hugs all your curves due to its stretch fabric (coton mix). Back zipper with back slit creates ease of movement. One of the biggest trends of the season are floral prints, so don’t miss out on this is one! Also available in Blue and Pink Hawai print!